Reverends Gaylen and Marilyn Doody have been members of Christ Gospel Church since 1975, and they have been pastors of Christ Gospel Church in Presque Isle, Maine since 1999.They have been married for 41 years. They have one daughter and two grandchildren. Reverends Gaylen and Marilyn were born and raised in the Caribou and Fort Fairfield areas of Maine. Rev. Gaylen is now retired from working in the Maintenance Department at the local United States Customs office, currently known as Homeland Security. He previously also had started a successful business in laying concrete foundations over 30 years ago. He is now serving in the ministry as full-time Pastor. Rev. Marilyn is now retired as a Bookkeeper at the local Honda dealership. 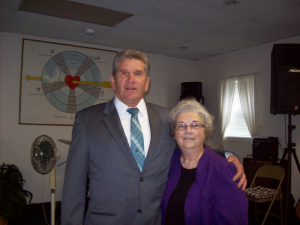 She assists her husband in the Ministry with administrative tasks and by teaching Sunday School. The members of Christ Gospel Church work closely together on special volunteer and community outreach projects. This includes preparing food boxes for the Hope & Justice Project, an organization that helps people affected by domestic abuse and violence; they visit local convalescent homes, singing special songs, which they hope brings joy to those in care. The church also sponsors the Aroostook Area Agency On Aging, which provides a wide range of support services for older adults and their family caregivers.